Fabio Toblini’s portfolio is as varied as it is stunning, including designs for the national tours of musicals including Fame, Godspell, and Hedwig and the Angry Inch, opera’s including Macbeth and The Magic Flute, and for plays such as Much Ado About Nothing, A Christmas Carol , and Sherlock Holmes. Toblini’s work for Ballet Arizona includes Ib Andersen’s The Nutcracker, Diversions, Eroica, and the his upcoming productions of The Firebird. Mr. Toblini trained at Milan’s Istituto Marangoni, Emerson College in Sussex, and Parsons School of Design in New York. Fabio Toblini’s sketch for the women’s costume in “Eroica”. Photo by Tzu-Chia Huang. 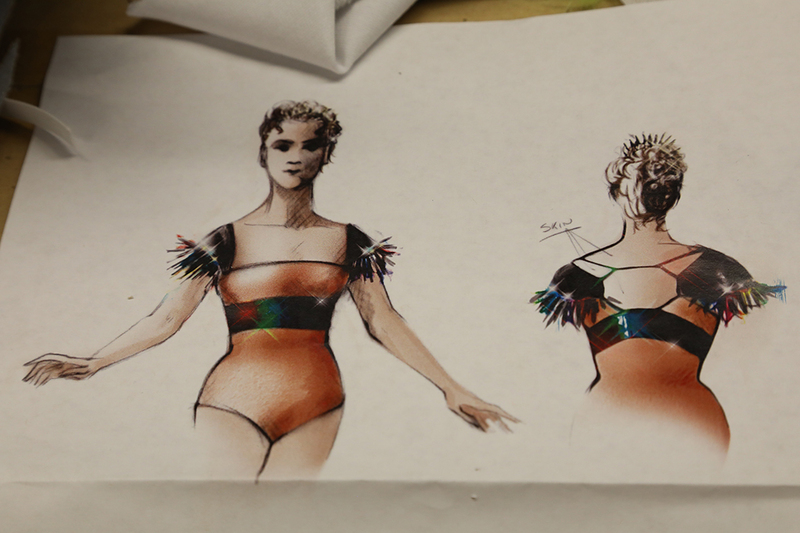 How did you get started designing costumes for ballet productions? It was actually Ib that called me in 2005, asking me if I was interested in designing his new production for The Nutcracker. I had never designed for ballet before, but Ib wasn’t deterred by that. He loved my take on color and my aesthetic and that seemed to be enough for him. He was looking for a designer that would approach ballet from an original perspective. Needless to say, I have learned a lot from Ib and his dancers. I’d like to mention Natalia Magnicaballi, who in the past has been a muse for my work at Ballet Arizona. 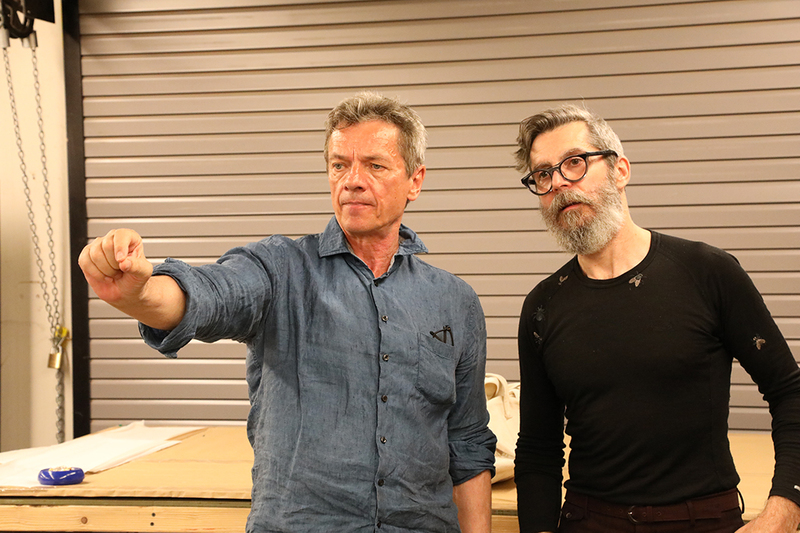 Fabio Toblini and Ballet Arizona’s Costume Director Leonor Texidor. Photo by Tzu-Chia Huang. Can you take us through your process when it comes to designing costumes? 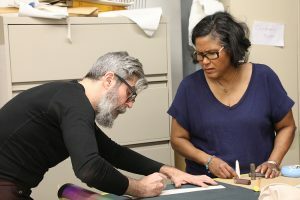 Designing costumes for the stage is a collaborative effort that involves directors, producers, designers, artisans, technicians, performers and (even if in our case not a living one) a composer and/or a writer. My process has to accommodate for the relationships that blossom with all my ever changing collaborators and their work. What is it like to work with Ib Andersen again? Even if Ib and I haven’t worked together for a few years, it felt like no time had passed since our last collaboration. We have always had a very direct and clear channel of communication. What research have you done in preparation for Ballet Arizona’s Eroica? The Eroica symphony is a political piece deeply tied to the time it was written. Ib chose to perform it now because many of the themes that inspired Beethoven to write it have become quite current. That’s how I decided to look back at the “empire” style of the beginning of the nineteenth century. Fabio Toblini and dancer Nayon Iovino. Photo by Tzu-Chia Huang. You visited Desert Botanical Garden for inspiration. How did the desert landscape impact your design process for the production? More than the shapes of the landscape, temperature influenced my design the most. This is why the costumes are very minimal and leave much of the skin uncovered. What impact do you want your costume designs to have in helping to tell the story? For this ensemble piece with such abstracted narrative I chose to develop a minimal design and let the choreography and the dancers’ bodies take center stage. Ib Andersen and Fabio Toblini. Photo by Tzu-Chia Huang. Don’t miss the final week of Ib Andersen’s Eroica at Desert Botanical Garden – click here for tickets!